Fuchsia Urban Thai introduces the Very Vegan Menu with over 16 dishes to choose from. The casual dining restaurant pride themselves on crafting recipes from scratch when it comes to the vegan offerings putting emphasis on natural and quality ingredients. 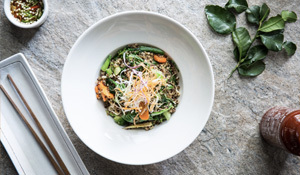 Available both at Tecom and Bay Square locations, the restaurant serves an array of delicious and healthy vegan food from chili basil fried rice, wok fried quinoa to mango sticky rice, there is surely enough for everyone. The unique and innovative vegan dishes of Fuchsia Urban Thai are distinct in taste and can even also tempt non-vegan customers to take a break from their usual cuisines and give these Thai with a twist grubs a chance, just to challenge their own palettes.